Since we are shopping majorly last minute for Christmas this year, the first part of this week, we’ve had UPS come to our door at least three times with numerous boxes from our online orders. Every year Jason and I try and see if we can successfully make it another year without having to step foot in a store for Christmas shopping. So far, we’ve succeeded. It’s a fun game to play and a bit of a challenge to try to think outside the box of gift-giving. Like, what can you gift someone that you won’t have to go into a store to look at? Tricky tricky! Are you done Christmas shopping or are you going to power through and do it all this weekend? Our mall used to be open until late..like midnight during holiday hours, but I think retailers are starting to think that’s a dumb idea for themselves and also store employees so now it’s just regular store hours throughout the holidays. I remember we used to go at 10pm when all the parents are already home with their sleeping kids and we’d pretty much have the entire mall to ourselves to do Christmas shopping. It was really nice lol..no dealing with crowds and driving endless loops for a parking spot. 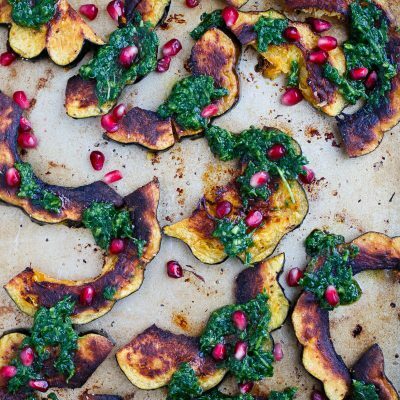 This recipe for roasted acorn squash with arugula pesto and pomegranate was inspired by our recent trip to LA. When we were there ove Thanksgiving, we went to Gjelina for dinner one night and they had this kombocha squash dish that we ordered and fell in love with. I couldn’t find kombocha squash at our grocery store so acorn squash will have to do. I loved how it turned out. The garlicky arugula pesto on top of the sweet squash and you’d get a burst of pomegranate seeds every now and then in your bite. 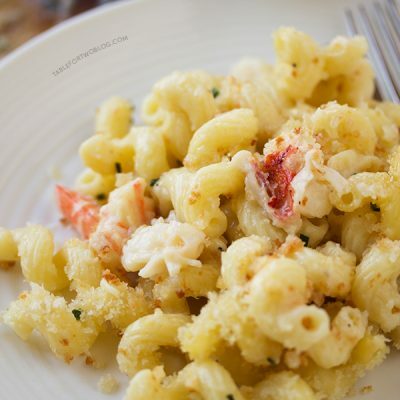 It is the perfect appetizer or side dish! Did you notice the fun color scheme? It’s so Christmas!! The shape of the acorn squash look like wreaths, too! 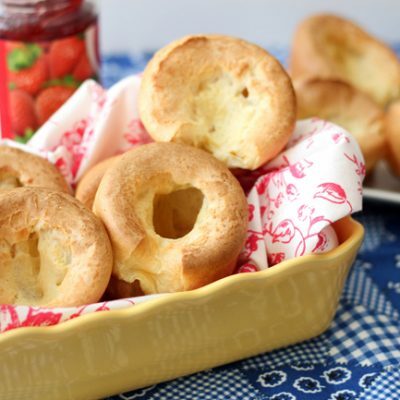 You’ll love this recipe and so will your guests! It’s a great side dish to accompany any holiday meal…and an even better way to sneak in veggies! 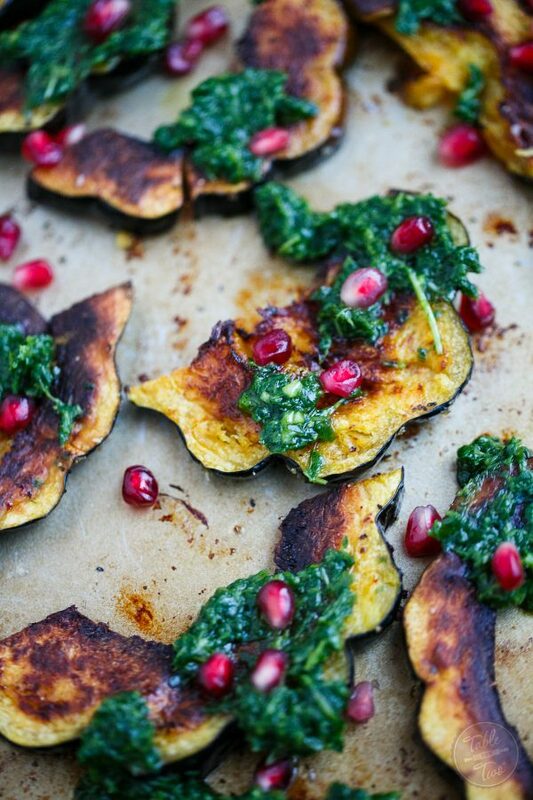 Roasted acorn squash with arugula pesto and pomegranate is a great side dish addition to any meal! Spread out sliced acorn squash onto a large baking sheet and drizzle with olive oil. Sprinkle salt and pepper on top then toss to coat. Roast in the oven for 30-35 minutes, or until squash is tender and softened. 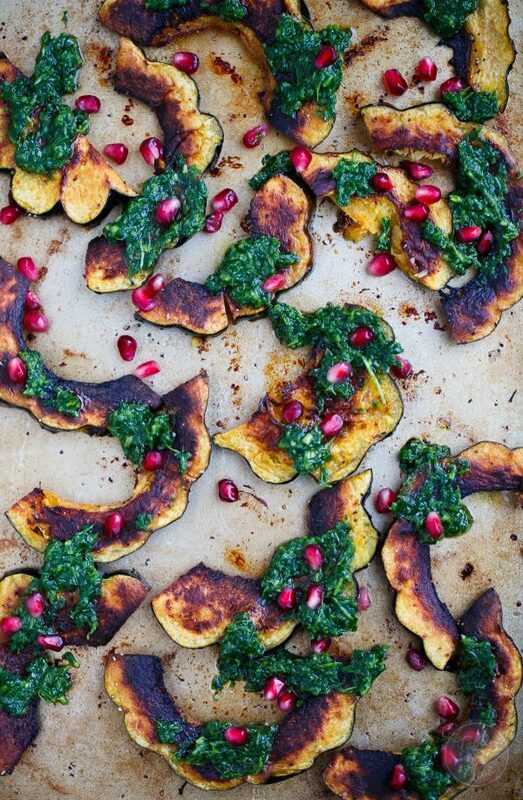 While the squash is still warm, place pesto on top the squash and sprinkle pomegranate seeds all over. Julie, I am head over heels in love with this festive holiday dish! So great. I love all the flavors and color. You kind of blew my mind with these. The scallops of the acorn squash have won me over for presentation. And those pomegranate arils on top? Wow, don’t they just add the right Christmas color to these (Well I”m calling them appetizers as that’s how I’m going to use them.) I’m hosting my annual Ugly Christmas Sweater Party next week and need apps to put on my new $200 artisan wood board that I’m also giving away on my blog right now. Thanks!! Great recipe. Could you recommend a substitute for the arugula? This recipe looks amazing, but I’m allergic to arugula. This is beautiful! I love how festive it is. That pesto is amazing. Thanks goodness for online shopping, I can’t handle the mall! 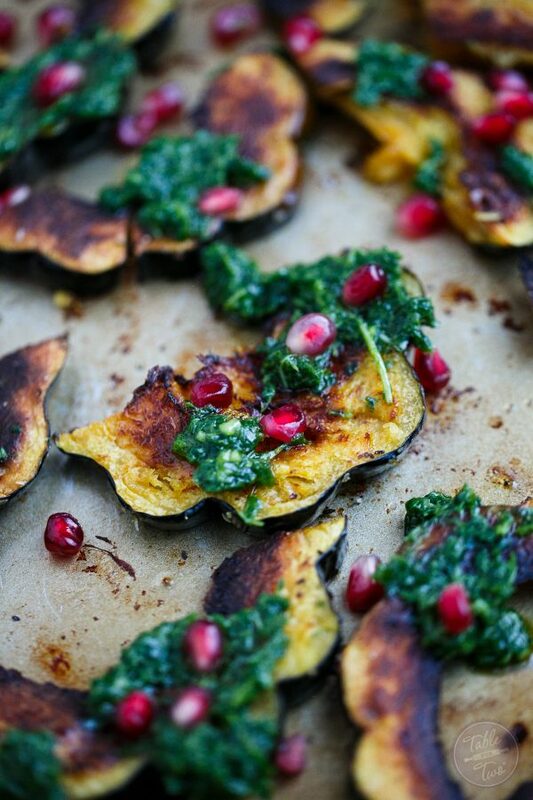 This roasted squash is gorgeous. I love the added pomegranate and arugula pesto, it’s perfect for Christmas! What a nice side for the holidays! 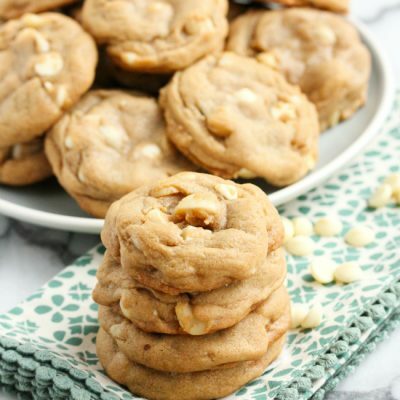 Can you make this recipe at my holiday party?! Wow, this dish look amazing! Love all the colors! Plus, squash is my fav! That squash has the most beautiful colors!!! Wish I had seen this recipe for Christmas. So festive!